The recovery in economic activity softened somewhat during 1Q while inflation has surprised to the downside. Market expectations for both GDP growth and inflation have, as a result, come down, paving the way for the central bank to surprise market expectations, at its last policy meeting, and announce the intention to extend the rate-cutting cycle a bit further than originally expected. Another cut is slated to take place on May 16, bringing the SELIC rate to a fresh record-low of 6.25%. But the biggest development in the local financial markets over the past month has been the sharp sell-off seen in the Brazilian Real. That surprisingly dovish guidance announced by the central bank in the April monetary policy meeting may have contributed to the subsequent BRL sell-off, but other factors also have played a role, stimulating an increase in the demand for FX hedge, as suggested by local market (BM&F) data, where a portion of FX hedging operations are conducted. These include technical factors in the local USD-funding market, which cheapened the cost of FX hedges, along with the growing realization that the upcoming electoral process is bound to trigger much volatility, amid renewed scepticism regarding the likelihood of a market-friendly result. External factors such as the rise in US Treasury yields, the strong USD and geopolitical/trade-war concerns seem to have had a more limited impact on the currency’s behaviour. The BRL sell-off, and the possible consolidation of a new short-term trading range centred on 3.50, is not likely to stop BACEN from cutting the SELIC rate one more time. A last cut is almost fully priced in the local curve. However, the FX weakness does support the view that monetary authorities will not wait until its next meeting to firmly close the door for additional cuts. Overall, given the benign expected trajectory for inflation, which should remain materially below the 4.25% target throughout 2019, we still believe that there’s substantial scope for monetary policy to remain expansionary for a prolonged period of time. However, that outlook should remain highly dependent on the electoral result, the FX market’s reaction to it and the new administration’s commitment and/or ability to implement fiscal austerity measures next year. As a result, even though the local yield curve remains steep, with about 230bp in rate hikes priced for 2019 relative to our scenario that predicts no rate hikes for most of 2019 (i.e. 75bp in hikes during 4Q), prospects for continued FX market stress suggest that the curve is not likely to correct much in the coming months, and should remain steep, incorporating large levels of risk premium, consistent with a scenario of heightened political uncertainties, FX volatility and persistent fiscal challenges. We have recently altered our forecast for the BRL for the next few months, incorporating a significantly weaker path for the Real ahead of the October elections, reaching an average of 3.70 during 3Q. Still, we expect the BRL sell-off to be orderly. Current USD/BRL levels already incorporate a less supportive political environment for the currency and, helped by a record-high external trade surplus, seem sufficiently attractive to commodity exporters, who increased their USD sales of late. In addition, we also expect FX intervention by the central bank to ease the path towards the highs we expect the USD/BRL to reach in the coming months. 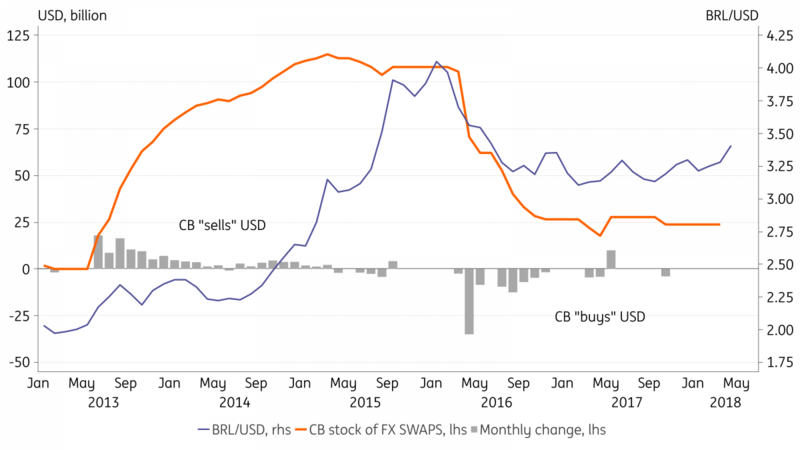 As the chart below illustrates, BACEN has recovered much of its ability to offer USDs liquidity through FX swaps (which do not affect the level of FX reserves). After providing FX protection for much of 2013-14, the central bank liquidated much of the program throughout 2016. The bank’s outstanding short-USD position stands at US$24bn, which compares with a peak of US$115bn in March 2015. This suggests that the bank could still offer close to US$90bn in FX swaps before the market starts seriously questioning the integrity of the US$380bn the bank currently holds in FX reserves. But, despite these buffers (i.e., trade inflows and ample room to intervene in the spot and derivatives market) the risk of stress scenarios in which the BRL tests all-time highs near 4.0 has increased materially. This would be the case for instance if a presidential contender clearly hostile to a pro-market agenda takes a lead in the polls in the coming months, a scenario that could gain traction, for instance, if the left unites behind a single candidate. Market unease should also rise if the candidates seen as capable of forming a Congressional majority, in alliance with the large center/center-right parties that are likely to keep control of the House (represented by the MDB-PSDB-DEM parties), remain uncompetitive. Demand for hedge will likely be one of the most critical drivers for the BRL and the fact that the cost to implement FX hedges has fallen dramatically over the past couple of years may prove to be a vulnerability at this point. The annualized implied yield in the USD/BRL 3-mo NDF dropped from a (peak) average of 12.6% in 2015-16, to a 5.7% average over the past month. In our view, FX hedges are attractive, and demand for protection should rise materially considering the highly uncertain electoral outlook and the fact that, given the urgency to implement robust fiscal reforms next year, the stakes are high. Moreover, the controversial nature of the reforms (notably the social security reform) suggests that local market volatility may extend into next year amid market scepticism concerning the new administration’s ability to deliver on the fiscal consolidation agenda. A large Congressional base and savvy political negotiation skills will be required to amend the constitution, as required for the social security reform for instance. Moreover, as seen throughout this year, without a strong executive pushing for fiscal restraint, Congress tends to become hostage to special interest groups, notably public sector workers, and associations representing rural and corporate interests demanding tax relief. The collapse in the Temer administration’s political capital this year has resulted in several decisions by Congress that have damaged fiscal prospects, including the failure to postpone the public sector pay raise and to increase public sector social security contributions, the approval of several tax relief measures, and the collapse of some privatization efforts. 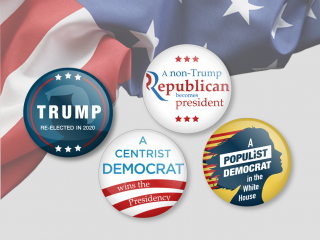 The most notable aspect of the opinion polls released in the past couple of months is the impressive resilience of candidates more closely aligned with an anti-establishment sentiment, or that the electorate perceive as representing “something new”. In fact, economic proposals remain secondary for the electorate, with anti-corruption or anti-establishment credentials along with views regarding security and the legitimacy of the Carwash corruption investigation carrying considerably more weight at this stage of the electoral process. This helps explain the very strong performance of Joaquim Barbosa, who, as head the Supreme Court (2012-14), managed to convict several politicians in a landmark case involving vote-buying efforts (known as “Mensalão”) that broke during former President Lula’s first term in office. Barbosa joined a party about a month ago, and according to the latest surveys, the former Justice could be a highly competitive candidate, coming in third place, behind Jair Bolsonaro and Marina Silva. Market favourite Geraldo Alckmin continues to lag, in fourth/fifth place, highlighting the difficulties the candidate may face to make it to the second round. Alckmin is likely to have considerable campaign resource advantages, when compared to the other candidates that are ahead of him. This may help him advance once the campaign starts officially, at the end of August. But the fact that he is the candidate more closely associated with the establishment should be a crucial obstacle, limiting his appeal. A heightened degree of uncertainty regarding both 1) what the candidates stand for in terms of economic policy and 2) their ability to form a working majority in Congress, suggest a high level of volatility for local financial markets. These elements suggest that, apart from polls, potential market catalysts to watch for in the coming months include 1) the candidates’ choice of economic policy advisers and/or possible Finance Minister picks, and 2) the establishment of party alliances, including through the choice of VPs, which will help inform the assessment of a candidate’s electability and ability to negotiate with Congress. Political alliances should begin to solidify over the next couple of months, at which time we should be able to better assess of how state-funding and state-sponsored advertising resources will be distributed across the candidates. The deadline for candidates to register is August 15, with state-sponsored advertising starting on August 31. In the meantime, market conviction that, at the end of the day, a market-friendly and fiscally-responsible candidate should prevail, backed by the broad centrist coalition that has been the base of President Temer’s congressional support, will continue to be tested. A united center would have tremendous advantages in terms of campaign resources, but the persistent appeal of non-traditional/”outsider” candidates suggest that electoral dynamics should remain hard to predict this year.